Blu-ray ISO file, or Blu-ray ISO image file, is an image file of a physical Blu-ray disc. It contains all the contents of a Blu-ray disc and can be used to replicate Blu-ray Disc for a backup or further creation to discs. And more and more movie lovers like to backup their Blu-ray collections to Blu-ray ISO image files for safety and convenience. An ISO is basically a file that is an exact image of a Blu-ray Disc. If you have Media Player software, you can easily enjoy the Blu-ray ISO image file with your family. However, we can’t easily find a Media Player software application enable us to play Blu-ray ISO image file. 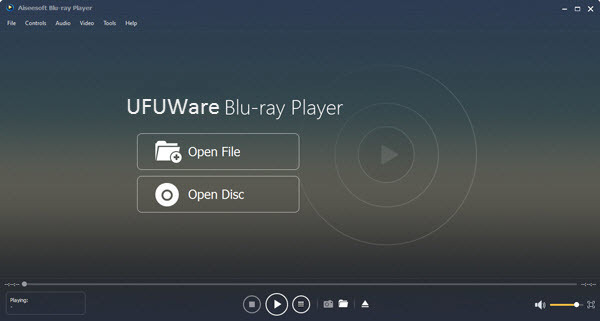 Don’t worry, UFUWare Blu-ray Player Software is recommended by millions of users to play Blu-ray Disc, Blu-ray ISO file, or BDMV folder on Winodws operating system successfully, no matter with BD+, or AACS. Apart from Blu-ray media format, it can also play DVD, VideoCD, MOV, MKV, AVI, FLV, WMV, MP4, MPEG, RMVB, MP3, WMA, AAC, AC3, etc, on Windows platform. Supporting High resolution up to 1080p and DTS audio system guarantees amazing audiovisual enjoyment with high quality. How to play Blu-ray ISO image file on windows? This guide would help you play Blu-ray ISO image file with UFUWare PC Blu-ray Player software without any quality loss. Any customers can easily download the UFUSoft Blu-ray ISO Player for free. Then users can install the application on your Windows 8.1, Windows 8 or Windows 7/Vista/XP computer. Then click the “Open Disc” button to open a browse window where you need to find the virtue drive on your Windows PC. Besides of enjoying the Blu-ray ISO on Windows from the beginning, users can also choose to play the specific Blu-ray title or chapter by right-clicking on the playback screen. Also this Blu-ray Player allows users to define the audio/video track, audio channel, playing screen size, and so on.